Congratulations on the arrival or expected arrival of your new baby! We are so happy to have you here with us. Although you might not be ready for it, there is a huge group of amazing people ready to greet you with open arms. Having a new baby is exciting, but it can also be overwhelming and a little bit frightening to find out you have a child with Down syndrome. The Canadian Down Syndrome Society (CDSS) is here to support and encourage you through all the ups and downs of having a baby with Down syndrome. Download our New Parent Package or contact us to receive a printed copy. Download our French New Parent Package. 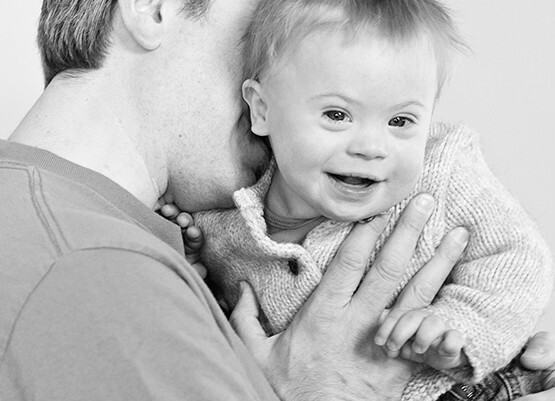 Read about the experiences of others to learn more about having a child with Down syndrome. CDSS has a wide and diverse community of people here for you. We found the most-asked questions on Google and asked 10 Canadians with Down syndrome to give their answers. Also visit our FAQ page. Having a Baby With Down Syndrome? While you may have been surprised to learn your baby has Down syndrome, know they will be a wonderful addition to your family. You are not alone. There are 50 Down syndrome groups associated with the Canadian Down Syndrome Society, offering information and support for parents and families alike. Please take some time to look through our website, contact our office, and connect with other families near you. We know there is a lot of information to absorb right now, but the most important thing to remember is that Down syndrome is just a small part of who your baby is and will be. Nobody can tell you how much your child will be able to achieve – all we know is what the 45,000 Canadians with Down syndrome have and continue to accomplish. There are many misconceptions about Down syndrome that stem from outdated information and stereotypes. Learning more about Down syndrome can help ease some of your uncertainty. Please take a moment to familiarize yourself with our information and resources, and encourage friends and family time to learn more about Down syndrome as well. When you are ready, connecting with a local Down syndrome group near you can be a great starting place after welcoming your new baby. Many towns, cities, and provinces have organizations, meet-ups, and support groups to connect local families. A comprehensive list of local groups can be found on our website; please take a look to see if there is one in your area. Understanding a Down Syndrome Diagnosis is now available as a free digital book. It is the only American prenatal booklet to have been reviewed by representatives of American medical and Down syndrome organizations. The goal of this book is to ensure that all pregnant women and their medical providers have access to the most accurate, balanced, and up-to-date information about Down syndrome. This book was developed by the Human Development Institute at the University of Kentucky. Congratulations on the birth of your baby! It is okay to be a bit sad and scared, but I hope by telling you a bit about my life, you will feel better. My name is Paul, I have Down syndrome and I am the Awareness Leader at the Canadian Down Syndrome Society. I have a great life and I feel very proud of it. It is important as a parent to have high expectations and to give lots of support to your child. Growing up, I had a lot of support and love from my family. This came from my parents and my sister. When I was young, I played sports and went to school every day. I learned math, reading, writing, and singing. I had a lot of fun learning and growing. I went to many schools and enjoyed them all. After high school I went to Mount Royal University and Columbia College. I went to university because I wanted to learn the things that I would need to get a job in the future. I did learn many important skills that helped me get many different jobs. Now, I work at the CDSS office. I was also valedictorian at my graduation from Columbia College! I live in an apartment with a supportive roommate. I am able to get to work on my own. I am independent – I have some help, but I’m able to do lots of things on my own. I was able to accomplish many great things in my life, and will continue to. Having Down syndrome did not stop me from doing all the things I have wanted to do. I want people to understand that I can do what others can, but sometimes need a little extra help, or need to do it in a different way. If you want to know more about me or have any questions about people with Down syndrome, please check out my blog. If you are reading this letter you, somehow, someway are on a similar path that I’ve walked. A path that, maybe, probably, wasn’t one you wanted to go down. A path that looks terrifying, uninviting, and not at all what you expected. If you are reading this letter you, somehow, someway, have a baby with Down syndrome. Wham-Bam-Slam-Slap! Right across the face; that’s honestly what it felt like, as I was utterly stunned. Everything I ever hoped for my daughter, for my little family, for our life together seemed to die in that moment. It was as if in his words, that doctor took the entire happiness out of our new baby. I’ve never wept like I did in that hospital bed. I’ve never cried for something I wished wasn’t true so hard; I’ve never begged fate to undo what couldn’t be undone. I was literally shattered in devastation. The following few days were a whirlwind of medical appointments to rule out other complications associated with Down syndrome. I couldn’t tell you one thing the doctors said during that time. My mind was in such a weird space, almost as if I was in the room but not truly believing that this was even happening, that this was our life, that this was our daughter. Right there, a few days after our daughter Pip was born, the tone of how people, doctors & others would value her life was set. In a way, that kind of made me love her more. Because you see, that genetics specialist doesn’t know what I now know. A diagnosis can’t predict the extraordinary love you will have for your child. A genetic counsellor can’t understand the fierce value you place on your baby’s life. A friend might not realize that your baby is an individual made up of so much more than a diagnosis. A stranger can’t possibly know the outrageously, beautiful insight you get to experience by seeing life through the eyes of someone with Down syndrome. An extra chromosome doesn’t mean the end of what you imagined. It almost means a life more beautiful than what you ever could envision. 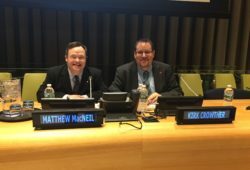 For my husband, the meetings with the doctors, the New Parent Package from the Canadian Down Syndrome Society, and reading as much information about Down syndrome as he could, helped. For me, it did not. I wanted what doctors, organizations, and articles couldn’t tell me. I wanted a look inside other parents’ lives, perspectives on how it all has changed them, and what to expect. While I was scared to look, and to discover what I feared, I was instead pleasantly surprised. 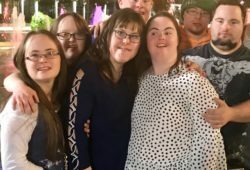 The more I looked, minus what Google or Wikipedia said about Down syndrome, the more I discovered what a unique and special diagnosis this really is. For me one of the hardest things after finding out Pip had Down syndrome was telling people. I didn’t know how to do it, how to react to strangers, what to say, what not to say. So I started by sitting down one night a few weeks after Pip was born and through tears, wrote out some pretty raw and emotional thoughts on her diagnosis; and from there my website Happy Soul Project started. But it’s one thing to share your thoughts behind a computer and another to be out in the world. A moment that really changed things for me was when Pip had her first surgery at five weeks old (she is one of the ones who has numerous complications associated with Down syndrome; congenital cataracts, congenital heart defects, hypotonia, hypothyroid). I had only written about Down syndrome on Happy Soul Project. So on this fated day I was down in the hospital gift shop and an older lady behind the counter asked why I was there. I explained Pip’s surgery and added, “and she has Down syndrome.” It was as if by finally saying it out loud, I had accepted it. The lady dropped everything, came around the counter, grabbed my shoulders, looked intently in my eyes and said “You are so lucky”, to which of course, I thought she was crazy. Here I was scared to say it out loud, unsure of how to tell people, almost embarrassed because of it, and she was telling me I was lucky. She went on to explain through genuine tears that she had a brother with Down syndrome and it was the absolute best thing in her life. It made her who she was and kept her entire family together. He was the joy the world needed and that I was so lucky to have that. Fearing an “I’m sorry”-type comment, only to be given the exact opposite, changed how I viewed a Down syndrome diagnosis and how I will respond to any new parent moving forward. In that moment I realized she was so absolutely right. I had been looking at it all wrong. Like I needed to learn to accept my daughter for her differences, when really I needed to learn how to celebrate and be blessed by them. Changing my perspective has changed my life and I’m sure the life Pip is going to have. Now it’s my mission to prove to the world that we really are the lucky ones. That is what now fuels Happy Soul Project, to show others that the unnecessary, negative stigma behind a Down syndrome diagnosis needs to change. I wish there was a way I could go back and save all those tears I shed when I found out Pip had Down syndrome. But I also think that grieving the loss of what I had envisioned for our future gave room for expecting the unexpected. Pip is not what I wanted in a daughter until I realized I never knew I needed this kind of love.